I’m baffled by your ability to wear metal that takes a tool to get off. (Read jealous.) I’m into that, big time, but couldn’t even keep my piercings, they drove me crazy. It’s even sometimes hard for me to handle my wedding ring. (Talk about slavery ;)) Cool. Coo-ool. And hot, obviously. So envious. 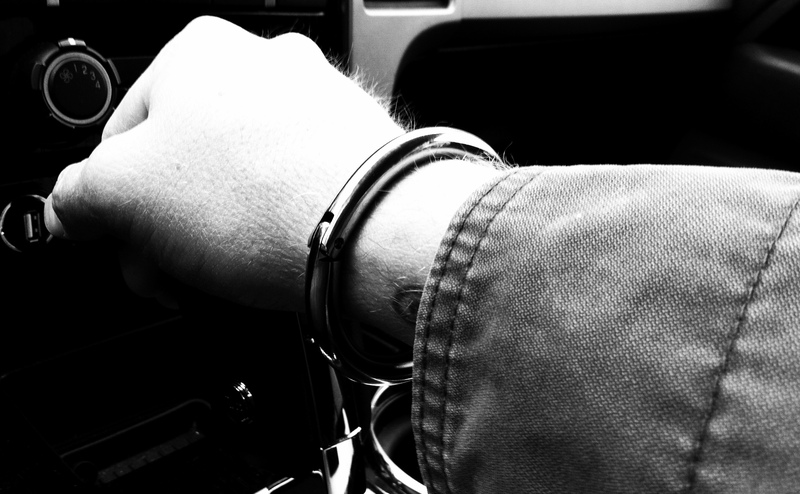 I know this is old, but I had to comment on how gorgeous your cuff is. Do you still wear it 24/7? Have you noticed any issues with the screw or hinges loosening over time? I ask because I’ve just received my first cuff (about 2 weeks ago now) and am curious what your impressions of it over an extended period of time are. I’ve had the same experience with ppl not noticing it, although I can tell by the expression when someone has recognized it for what it is. 😉 The ones that knows me looked stunned, but recovered quickly, though his eyes couldn’t leave it alone. I find that the very obviousness (is that a word?) of the cuff, the fact that it’s out there for any and all to see and recognize, adds to the thrill.